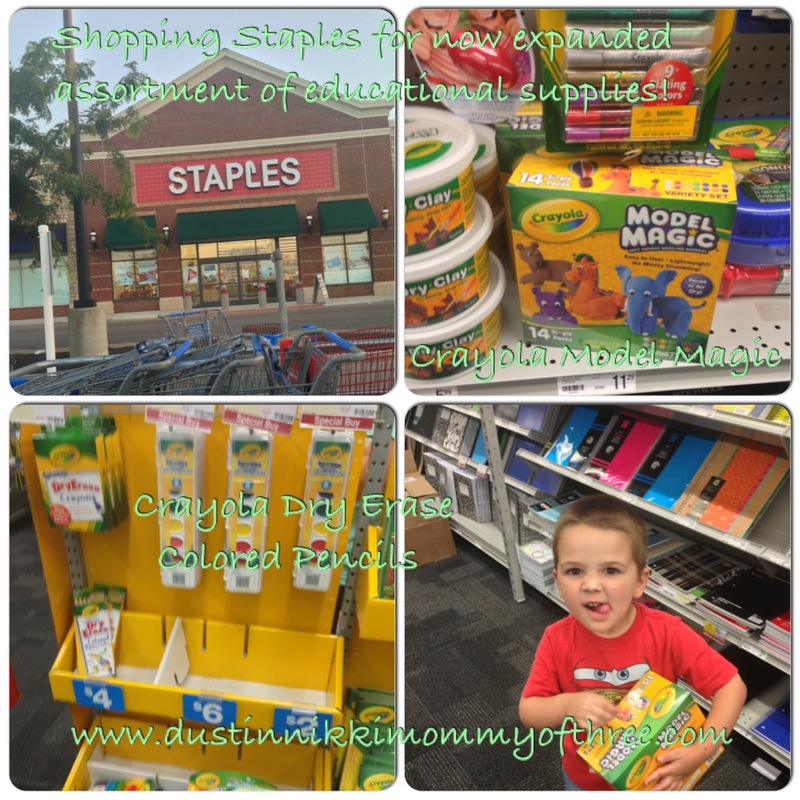 Did you know that Staples stores have new shops? They sure do! At select stores, they have a “Crayon Wall” where you can pick up an empty tin and create your own customized Crayola crayon tin with the colors you choose yourself. They also have an expanded assortment of educational supplies at select stores too. Products may vary at different stores. Here recently, I was given the opportunity to post about it and received a free Crayola crayon container filled with assorted colors along with a Staples gift card to put towards any of their products that are included in their expanded assortment. The first thing that I want to tell you about is the crayon tin. The container that I received is really great. The lid screws on so when they are put away, there’s no spilling of the crayons. There is a plastic piece inside that can be lifted in the middle so you can get the crayons out easier. I love having this container because I usually have old school boxes that our crayons are just thrown in and we end up with a lot of broken crayons eventually after my kids have dug and sifted through the box to find what they are looking for. This container keeps them standing up and prevents breaking. I absolutely LOVE the idea of going and picking our own Crayola colors. There are so many times that we wished we had more than one certain color and there are other crayon colors that are rarely used. You can choose colors from Watermelon to Mac & Cheese to Royal Purple Glitter! Our trip to Staples went really well. With our gift card, we picked up a couple of the expanded supplies along with a few other things. One drawback to going to Staples is that I end up buying more than I intended and that’s because they tend to have great prices, deals and sale prices often. I actually exceeded my $25 GC limit. In fact, when we went in there, they had a deal that if you only spent a total of $5, you could get selected items (up to 10 mix and match) for only one cent each. So I got some more pencils, pencil top erasers, index cards and some more pocket folders. Anyway, back to the expanded assortment. We bought Crayola Dry-Erase Colored Pencils and Crayola Model Magic. I was going to pick up some Melissa & Doug Scratch Art because my kids love doing them but they had run out. Staples has a great selection of Crayola products too also with great prices. Makes this momma happy! The Crayola Dry-Erase Pencils are really awesome. I got them for our youngest because if he gets ahold of any pens or markers, he ends up coloring on himself rather than what he is supposed to. I love using dry erase products because when it comes to practicing writing letters, numbers, and drawing shapes, they make things easier since you can just wipe them off and start over. Less paper to go through. Since I don’t even want him having dry erase markers right now, I thought the pencils would be perfect. He can use his dry erase books without getting marks all over him. They don’t come sharpened in the package. You will have to sharpen them and they do come with a hand held sharpener which I recommend using rather than an electronic sharpener. The reason is because since they are dry erase, the points are a little softer than regular colored pencils so they can break off easier when using something other than one of those hand held sharpeners. They do sharpen really clean though and really well. It doesn’t take much pressure to make them write. At first I had to keep reminding my son (he will be 4 years old this month) that he didn’t have to press that hard. He finally got it. I think they are really great, they write really well and the colors also look great. Awesome quality – of course they are Crayola which happen to be my favorite brand when it comes to these supplies. The Crayola Model Magic is really cool. The set we bought included 14 packs of model clay. Almost 2 of each color. The colors that are typically used more than others had two each which is nice. I’m not sure if I want to call it clay or dough. It’s more of in between. It claims that it lasts longer and stays moist longer than regular clay or dough when stored in a container for re-use. I found this to be true. Another thing that I love is that it literally does no crumble. Not a bit. It’s softer (almost spongy) and makes molding a LOT easier especially for younger kids my son’s age. It’s very easy to shape, mold and manipulate. You can also make things and leave it sit to harden. Model Magic does take a little longer to harden though but I think that’s because of the texture. Which is fine by me because when it hardens, it doesn’t harden in the way that regular clay does in a way that it could chip or break if dropped. It doesn’t stick to anything including hands but itself. This is also great because when you are molding something, you can just add what you need to without having to press it together possibly messing up whatever your child molded. For example, my son wanted to make cones and add eyes and hair to them. Then let them harden so he can use them as a mini bowling game. When we made the eyes, all we had to do was simply place them on the cones without really pressing because it stuck to itself. They never fell off and they hardened on them. 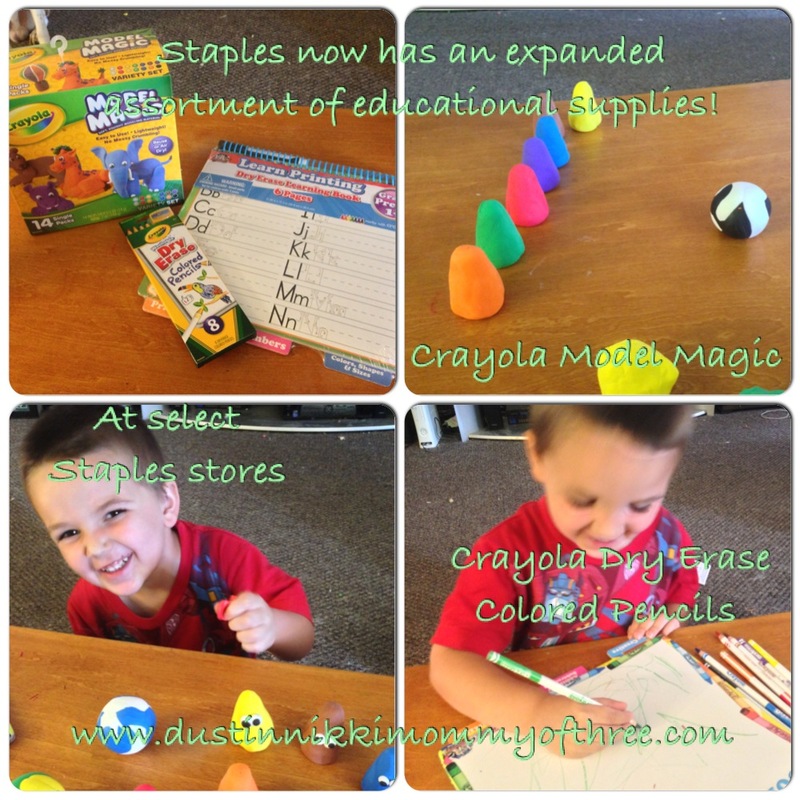 I absolutely love Staples expanded educational supplies and I already liked shopping Staples anyway! Buy It: You can find these products at Staples stores (products may be limited to other stores) and you can also find them on Staples.com. 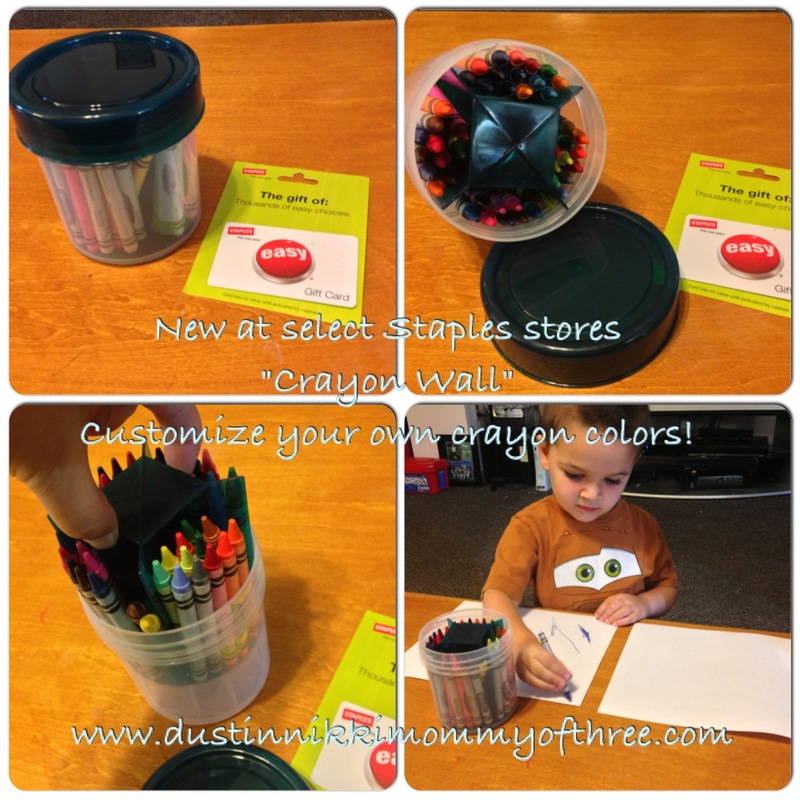 Check out the “Crayon Wall” and customize your own tin (select stores). Check online to see which stores they are available at! Win It! 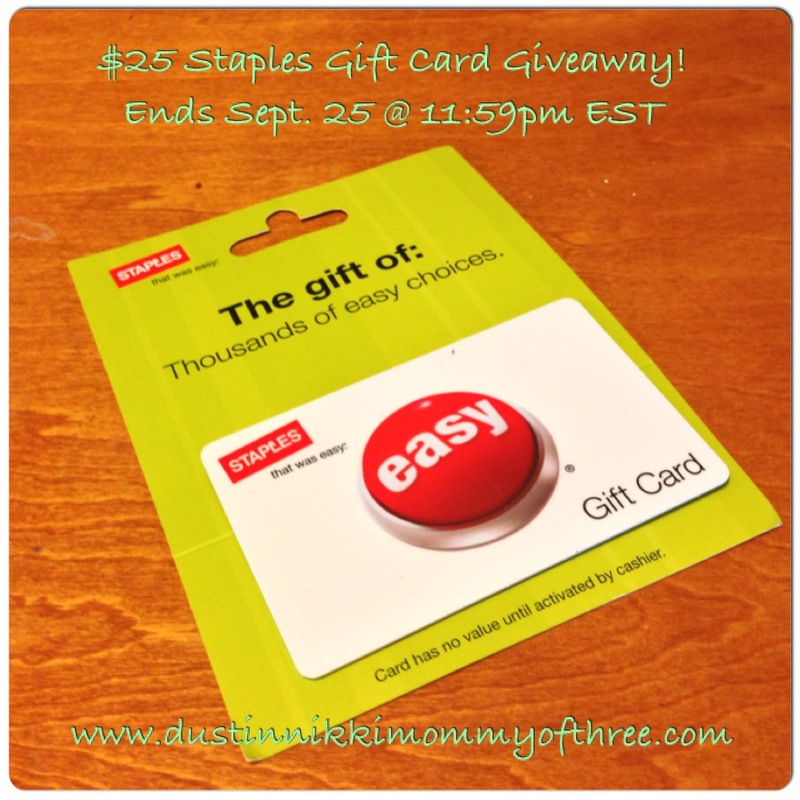 Thanks to Staples, one of my lucky DustinNikki Mommy of Three readers will win a $25 Staples Gift Card! Disclaimer: I was not compensated for this post. However, I received free product/Gift Card for free from Staples for my use/review and blog post. Gift Card prize will also be sent free from Staples to the giveaway winner. All thoughts and opinions expressed in this post are 100% my own honest opinions even if they differ from others. I’d buy the Crayola Model Magic for the kids – looks fun. I’d also get some tape, construction paper and glue sticks. Canon PG240XL/CL241XL Black and Color Cartridges Photo Value Combo 2/Pack, High Yield for my printer. I don’t know if they have this in every store, but in my area they have a huge crayon display where you essentially build your own box of crayons. That is what we would use it for. The “Crayon Wall” is awesome! It’s only available in select stores – glad you have one in your area! I would buy crayons, construction paper, and markers. Ohhh, and note cards! I’d love to buy some of the Martha Stewart Avery products. I would buy printer paper.